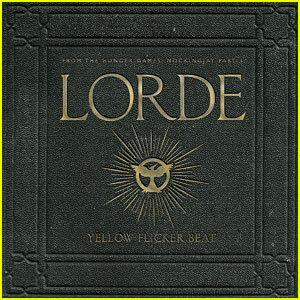 LORDE RELEASES NEW SINGLE, “YELLOW FLICKER BEAT.” COUNTDOWN TO MOCKINGJAY BEGINS NOW! It’s always confusing when a movie soundtrack comes out, yet the actual songs do not appear until the credits start rolling. It may be a tricky decision to make, but for the Hunger Games producers, it was an ingenious idea that allowed avid fans to have another outlet in exploring the world of Panem. The soundtrack for The Hunger Games and Catching Fire allowed major artist such as Coldplay, Of Monsters and Men, and Lorde, to give their voice to the movie, putting the themes from the book into sounds. This time they have done it again and Lorde is back contributing in a major way. The two-time Grammy winner is the curator on the Mockingjay soundtrack and will have full creative input towards the project. The first single off of the soundtrack, “Yellow Flicker Beat”, shows off the insight and tone that will be featured in the film. In typical Lorde fashion, it begins with the deep beats trickling into a darker tone. Any fan of “Royals” and “Tennis Court” will be impressed. Lorde’s lyrics can get dark, but it spells out Katniss’s thoughts from the book, right onto paper. The full soundtrack will be released November 18th.